In this depiction of the Last Supper, each element of the meal on the table has a specific meaning. The fish is a common symbol for Christ, the bread and the wine are associated with the Eucharist, and the pretzel is a symbol of everlasting life as its form was originally designed to recall a child's arms folded in prayer. 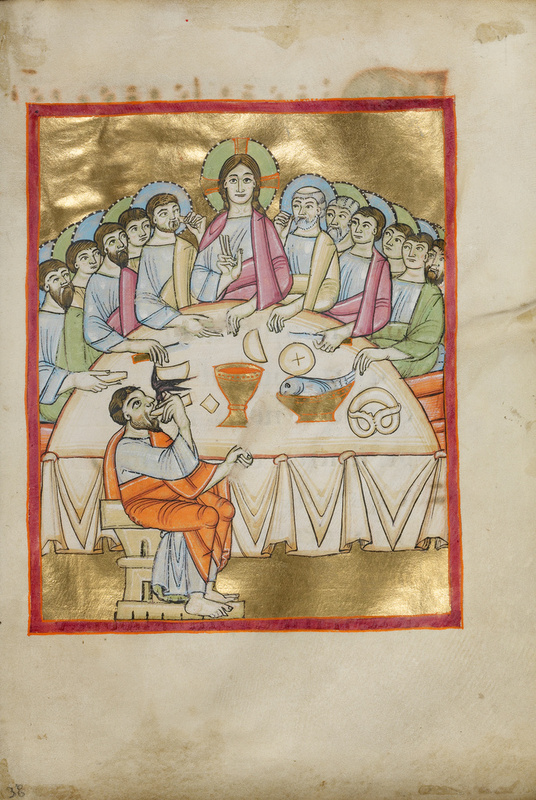 The miniature accompanies the blessings to be said for Holy Thursday, which commemorates Christ's last meal with his disciples. At this meal, Christ anticipated his betrayal by one among the group. The unknown artist clearly identified Judas as the betrayer by placing him alone and without a halo on one side of the table, by painting his cloak a distinctive orange, and by placing a demon in the shape of a bird near his mouth.